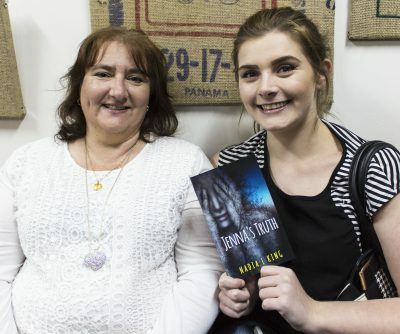 Monday’s launch of Jenna’s Truth was a fantastic night. We are so thrilled that it was well received. We had almost 80 people attend the event and a lot of fun was had by all. Fabulous Antz coffee (and tea and hot chocolate) was flowing, the cakes were delicious, and the conversation lively and engaged. The place was packed and although I attempted to invite people to spill out into the courtyard most were happy to rub elbows so they could be part of the action and excitement that buzzed around the room. The night started as one might hope, with guests arriving (en masse!) My lovely daughter, Kaylie, manned the door to take names as people arrived and together with my mother, Stephanie, they welcomed everyone who came and ensured they received a voucher for complimentary coffee and cake. The queue to place orders swiftly grew but the staff at Antz HQ were full of grace, worked fast, and prepared a wonderful spread of choices to flavour the palette and refresh the mind. When the stampede of arrivals had slowed I turned to my friend David (of the loud voice) to call attention over the rabble of conversation and celebration so that I could begin the short, more formal aspect of the night. Nadia and I both spoke about Jenna’s Truth, it’s inspiration, and our reasons for being involved with this book. Nadia spoke far more eloquently than I, wisely following her daughter’s advice to prepare what she wanted to say. Then we opened the floor for others to speak. We were so blessed to have fabulous people at our launch. And especially blessed that among the crowd three lovely ladies were brave enough to share a few heartfelt words. Justine O’Malley from Protective Behaviours W.A. 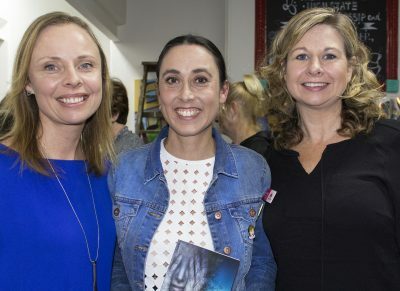 ; Sarah Jessen who is a Counselling Psychologist; and Stephanie Hewitt my business partner, dyslexic mother, and first Aulexic reader. Justine spoke about the role of Protective Behaviours and how we often think this intervention relates to younger children but that we also need to continue working with teenagers and young adults. Teaching strong resilience and self-advocacy so that children grow into confident, capable adults who can stand up for their own rights and trust in their own instincts is such an important part of the education we need to give our children and teenagers. Jenna’s Truth is a valuable tool for schools to be able to deliver these kinds of lessons in a way that respects the experience of teenagers and as a way that will engage and inspire them. Justine thought it was a wonderful idea to have Jenna’s Truth in book form so that it could reach classrooms across the country. Sarah then spoke about her experience working as a psychologist who sees the psychological scars of the school years well into adulthood. The damage done in our youth has a lasting impact. So many adults can remember traumas from their teenage years, like those Jenna experiences in Jenna’s Truth, and it shapes our futures and the people we become. And I think the most important part of Sarah’s message was that just having one person to be able to turn to, to trust, and who will support you through those hardships can make all the difference for which way your life then unfolds. Finally, Stephanie Hewitt spoke as one of those adults who even now is only just learning how deeply hurt she was by her experiences as a teenager. 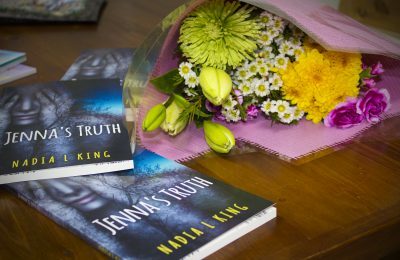 Reading Jenna’s Truth gave her a new frame for her own experience, and made her see how having someone like Mrs Philips (the saviour teacher in Jenna’s Truth) in her own life, really did save her life. It made her realise how important it is for today’s teens to have people in their lives that love and support them. It is important to have people who will stand up and put a stop to the things that are hurtful and wrong. And that, we are all in a position to be that someone for the people in our lives. 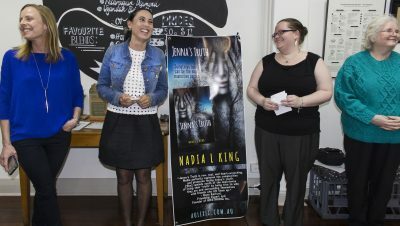 Nadia L. King connecting with our target readers. One of the really wonderful things about the night was the opportunity for Nadia and Jenna’s Truth to connect with teenagers. We saw some wonderful, smiling faces of our teenage readers. These are the lives we hope will connect with Jenna’s Truth the most. Sarah and Stephanie’s words showed us that even adults will resonate with and come to love Jenna’s Truth but the reason Nadia and I are so passionate about this book is because it has the power to resonate and reach the teenagers of today and create different outcomes for them. It was wonderful to see Nadia able to interact with these young people, and see the smiles on their faces. Mother and daughter, sharing Jenna’s Truth together. It was also great to see families connecting over Jenna’s Truth. Seeing parents and their teenagers having the opportunity to open a dialogue about the teenage experience and about bullying, suicide, and the real emotional challenges that we face as we grow up is such a powerful thing. I loved seeing the parents and teachers in the room who had come because they wanted to reach the teenagers in their life. And the teenagers who came because they love this story and believe in its message of hope and resilience. Nadia’s daughter Ellen running the bookshop! And the younger ones got in on it too! Nadia’s daughter, Ellen, isn’t quite at the age where Jenna’s Truth is right for her. But she supported her Mum (and me!) in such a phenomenal way on launch night by putting her math to the test and managing the book sales. I was so run off my feet that I didn’t have a chance to check back in with the sales desk too often. My daughter Kaylie was also run off her feet meeting and greeting with people as they were arriving that in the early part of the night she didn’t get to the back of the room but book sales were going strong all night long thanks to Ellen’s initiative and assistance. She’s a little super star! Ellen wasn’t the only little one getting in on the action either. I’d brought along a few of our P.I. Penguin books in case anyone who had come for the dyslexia angle might be interested in other books in Aulexic’s range. When a few people were snapping up those, they took advantage of all three Bec J. Smith writers being under one roof to get copies of P.I. Penguin signed. signing a P.I. Penguin book! 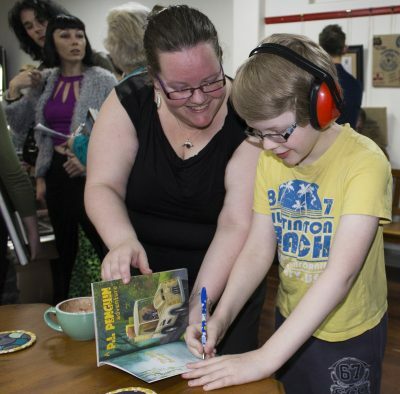 Here’s my son Joshua doing his part in the Bec J. Smith trio by signing his name in this book. (And can I just say how pleased I am seeing his excellent pen grip here. And the smile on his face as he does it. 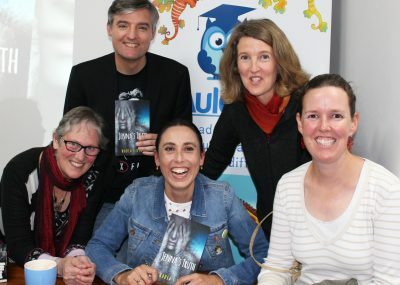 And, we were so thrilled to be able to share the launch with our fellow children’s book writer’s from the Society of Children’s Book Writers and Illustrators. 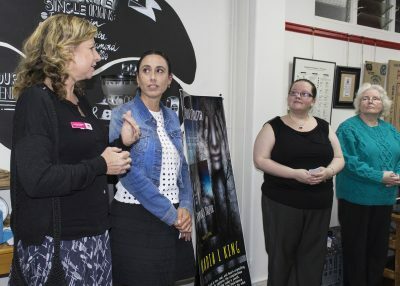 Huge thank you to Teena, Denis, Cristy, and Heather for coming along and showing your support. It was so great to have you there. Finally, it was wonderful to be able to play heart-touching music along to the selection of images, book reviews, and special quotes from the book. A huge thank you to Jenna Feeney for permission to use her music. We hope everyone had the opportunity to hear “Speak” on the night, although it’s possible it was drowned out in the buzz of conversation and engagement as everyone talked and interacted with each other. The lyrics are printed in the back of the book and you’ll see why those words resonate with us; because they are ultimately our message to teenagers. Please, speak up and share what you’re feeling. There are people who can help you. You matter, your voice matters, and your life is only just beginning; something magical awaits you if you hold on long enough to discover what the future has in store. As you can see, we had a really fabulous night. A huge thank you to all who attended. Your support means a lot to both Nadia and myself. We’re thrilled to be able to share Jenna’s Truth with the world. It is a project deeply in our hearts because we truly believe in the message Jenna’s Truth shares. We hope this book can make a difference. And this launch is only the beginning of the journey, we’re looking forward to bigger and better things to come in the weeks and months and years ahead. Want to see more pictures of the night? Check out our album on Facebook! Were you there? If you were there on the night, we’d love to hear what you thought.